Seeing that Building a 8th Edition List (henceforth B8EL) is by far the most popular part of the BT 101 guide, I'll go into another list building exercise to help you build proper competitive lists for 8th Edition of Warhammer 40k. Its unfortunate, but even nearly a year since the release of 8th Edition (at the time of this writing), people are still building 7th Edition armies and putting them onto the board expecting them to be competitive. This doesn't just go for the Black Templars; even the newest codices are being misused. While the BT have to work with the limited resources that we have available, other armies are chock full of options and different builds that are good. Any of the principles you find in these articles can be put to use in your other armies as well. This exercise will focus on building a real competitive all-comers tournament list, unlike our previous list, which was better suited to casual competitive play. As with our last rendition, this will be a 2000 point list, as that is the prevailing points limit in the USA. If you are outside the States and reading this, I'm sorry, just email me if you have questions on how to cut down your lists if you need the assistance. Using the important list building skills shown here to create optimized lists does not mean you will auto-win your games. It takes tact, skill, and cunning to properly use your forces in a battle. While most of my lists are play-tested over numerous games and I win far more than I lose, I know how to play my armies. They do what I designed them to do, but a player cannot expect to pick up the list and know all the intricacies of it right away. Experience! Nor do I claim that my lists will beat every army out there. While I paint a bleak picture here, do not lose the faith. We are better than most players give us credit for and if you practice the basic list building skills shown in these articles, you'll put yourself in a good position to win. So what are you waiting for? Read on! We have to start someplace in the army building process; it'll be deciding what type of army we'll be running. 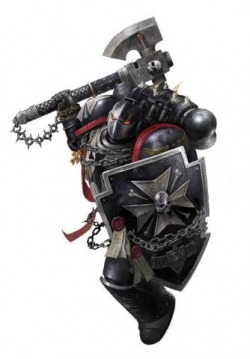 For many reasons, footslogging Black Templars are out. They are slow to react and maneuver, extremely vulnerable to shooting, and just plain don't have enough fire support on the board. Because of this, we have two choices: Mechanized armies or Drop Pod armies. Because I don't own any drop pods myself (I borrow them for games I play using them), we'll go with another mechanized army. I plan on doing one last B5EL article, so I'll go with a drop pod army on that one because it is one of our most competitive builds. But most players are probably on a budget, so we'll go with the cheaper option first. So what do we want our army to do? I like close combat and the prowess that is provided there by the Black Templars. It was what drew me to them in the first place when they were released in Codex Armageddon. But is that what we really want to do now? The rules for close combat result in things getting killed much quicker than in the past, so having a good close combat army can devastate an opponent. If you can get there. With so many armies out there fielding gun-line armies (especially the IG), you have to decide if that is a risk you are willing to make. Do you put all your eggs into one basket and hope that our smoke launchers see us to the end? Or do you play the meta-game and field a shooting army ourselves? A difficult choice to be sure, as both options can be fielded to be competitive. I think we need to go a bit deeper into the process to really get a feel for the answer. The goal is obviously an optimized and competitive list that is fun to play. But how do we do that? We need a balanced, all-comers list for sure. But could mean anything. 5th Edition put an emphasis on vehicles with the new damage chart, mobility to react and redeploy to various parts of the board, and shooting with the new line-of-sight rules. Combine that with the values of duality and redundancy, and we'll have the start of a good list. Sandwyrm put out an excellent article which shows the elements of being able to handle any opponent that is put before you. They are: Long range light anti-tank firepower, close range heavy anti-tank firepower, close range anti-infantry, and maneuverability. These might seem obvious, but more often than not, most of the BT lists I've seen players put out lack at least one of these (if not two). You need long range firepower to disable your enemy's lightly armored fire support vehicles, as well as his transports. The sooner you are able to force your opponent to walk, the less time you'll have to worry about those troops getting to your lines and messing up your units. You also remove your opponent's mobility, which we'll get into in a second. Traditionally, we find this in Autocannons, Lascannons, and Missile Launchers. While being able to deal with heavily armored vehicles at long range is a bonus, most armies cannot do so. So you certainly have to have a way to do so at close range, because more often than not, this entails land raiders full of terminators. They need to die, and without a way to do so, they will ravage your lines. For most Imperial armies, this is found in melta weapons. But what about infantry? You've destroyed your opponents vehicles, but have no way to dealing with the guys inside. Guess what? You've lost the game. An example of this is an army tooled to face vehicles but finds themselves facing off against a Tyranid army. The Tyranid player will probably win that game before its even started. You need some way to kill infantry, even if it is via close combat. Ideally, you want a firepower option as well, because you cannot always guarantee your troops will make it to close combat. Obviously high strength weapons do not fit this role, as they normally only put out one or two shots a piece. This is not enough to destroy the likely 30-40 MEQ (Marine Equivalent) infantry on the board. Or even worse if your fighting GEQ (Guardsman Equivalent) infantry as they are fielded in much higher numbers. Other weapons are needed. Bolters, Assault Cannons, Flamers, and Heavy Flamers are our best options here. Anything that can provide a decent amount of "Torrent of Fire" (henceforth ToF). Having this ToF forces your opponent to take so many armor saves that he is bound to lose something. This is especially true for 2+ save and/or multi-wound models. Lastly, maneuverability. You need to have a way to get around the board at will. Without this, a cunning opponent will place his forces out of reach. Or they will put objectives out of your range. Having mobility will add another dimension to your game that will allow many more tactics to come into play. You'll learn about some of those in BT 101: Playing With Your New Army. The point is, without that speed, you are slow to react and play the game based on your opponent's actions. With maneuverability, you are able to be proactive and set the tone of the game. Knowing all of this, we have to look at our possible archetypes and decide which one puts us in the best position to win. Will it be CC oriented or shooting based? Noting 5th Edition's affinity to the shooting phase, I've decided to make a gun-line army. We have to be careful here, as gun-line lists potentially have difficulties against CC-heavy armies (or mob based). So we'll have to make sure we account for that in our list. That brings us to a pretty low count of 330 points. Not a bad start. However, we'll not get anywhere without a transport for each squad. Going with our theme, we'll take Razorbacks with TL-lascannons. These are somewhat spendy, but will give you mobility and firepower your opponent will have to at least think about taking out. Hopefully we'll put out enough targets that its not first on the list. We'll also need at least one more troop squad just like the previous two at the very least. So far, we've got a pretty decently sized troops allotment as well as our HQ unit. Our troops have fulfilled our obligatory mobility needs and the Long range Light Anti-Tank firepower, but we can always use more. Fortunately, we still have three slots that we've not taken anything out of. We'll take a look at Heavy Support first, as it plays into our firepower theme the best. We need to take a long and thoughtful look into our choices here. In the last B5EL, the list started out with Vindicators but we opted to take them out for predators. In this list, three wouldn't be too bad. Previously, they didn't fit because of the assault nature of the army. Here, we'll probably sit back and let our opponent come to us. Vindicators can come up from the flanks and blast holes in your opponent's line once they are out of transports. Predators are also excellent choices here, but we need to decide whether or not we want more AT fire or to go with AI fire support. Dakka Predators are extremely cheap and fulfill an excellent duality role in the army. They can take out AV10 without a problem, as well as be directed at infantry or monstrous creatures. Three would provide all of the AI we will need, but will we have enough AT with the rest of the list? Well, we could go half way and take three predators with TL-Lascannons and heavy bolters. This would provide us additional AT firepower, while giving us some AI if needed. As much as I would love the sight of three Vindicators bearing down on my opponent scaring them senseless, they are too expensive and vulnerable. That means Predators. Because we don't have any AI firepower in the list yet, we'll try three Dakka Predators and see where that gets us. The count is 1025 points. Leaving with just under half of our points to play around with. So what do we have left to achieve? We've got our long range light AT firepower, we've got mobility, and we've got anti-infantry firepower. That leaves close range heavy AT fire support. We've not added them yet, but there can be only one place to get that: Land Speeders. These are one of the most underrated units in our codex. Their worth to the battle cannot be expressed with words. They are definitely going in. We'll take 3 Typhoon-pattern Land Speeders, as they are a ghastly cheap 70 points. These provide excellent maneuverability and duality, which is important for our force. Almost back to square one. The points total is 1084. But this time we can fix some issues we've had. We still need AI fire support, but we're lacking in the AT department where it really counts. I'm not going to touch the Heavy Support slot yet, as it'll depend on what kind of points we have left in the list after we're done with the Elite slot. For sure, we need to add the Venerable Dreadnought that I mentioned earlier. With Tank Hunter, this guy will be able to take out heavy armor from a distance, which is very nice. He's super expensive though, but with extra armor and venerable, he's pretty durable. Also going in will be one more dreadnought armed the same, but they won't have venerable or tank hunters. That's okay. They are still good against AV12 or lower. That puts us at 1549 points. I'll show you what the list looks like for reference purposes. Looking over our list, what do we have? Do we have our required duality, redundancy, and succeed in building an all-comers list? If you remember, we needed to meet all four of Sandwyrm's keys to building a balanced list. I think we did pretty well on that front. We've got 16 different units that can fire on the first turn to take out light armor. Several of those have multiple weapons for the task. All of our firepower can be used effectively at any range against Infantry and Light-Armor; while our Tank-Hunter units give us credible heavy armor busting power. The land speeders double as AI firepower and provide late-game objective contesting. In addition to the speeders, we've got the dakka predators dedicated to anti-infantry duties, as well as the Terminators if its necessary. This will be especially important after we've knocked out all the opposition's transports, or if facing Orcs/Tyranids. Finally, nearly everything has either a transport or can move at least 12" a turn itself, with the terminators as the exception. That is our required mobility, though, fielding a gun-line army will keep us in our deployment zone for most of the game. Still, its there should we have need of it. While "Kill Them All" is a concern, as is Righteous Zeal, there are ways around that. The Emperor's Champion will attach himself with one of the crusader squads to act as a deterrent to charges as well as provide his Ld 10 to that squad. That leaves only 3 units that are left with low Ld for "KTA". The RZ issue can be solved by merit of consolidation move rules. It says you MAY move up to the distance rolled on the D6. You don't have to move the full distance, so you won't really be moving anywhere you don't want to. Another big concern is one I mentioned at the beginning of this article: Facing close combat-oriented armies. As you have already probably noticed, we've got minimum protection in the close combat department. These are found in the Terminators and the Emperor's Champion. He does provide 4 Strength 6 power weapon attacks (WS 6) on the charge, so the crusader squad he's with could potentially be delegated to close combat duties. The Terminators will be able to deal reasonable damage to an opponent, provided they live long enough to attack back. Fortunately, what we DO have is lots and lots of firepower. If you use proper target priority practices, you should have your opponent's forces walking. This will give you time to mount a sufficient defense to counter them, or just plain destroy them at your leisure. Even against Tyranids, we have so many shots available that we should be able to kill 2-3 monstrous creatures a turn at least. Trygons? No problem! Having issues with Tyrannofexes? You've got a 14 Missile Launcher salute for him (not even counting the 8 Lascannons)! All while packaged in a completely mobile force. Lastly, I'm concerned with our lack of numbers. We've only got 31 marines in the force. That doesn't give us a whole lot to work with, but fortunately, it does still provide us with 4 different scoring units. We've got MSU down pat in this list, so that should save our hide in the end. However, MSU does play against us in Kill Point missions, as we provide 17 total KPs in our army. Just something to be aware of. Taking one final look at this list, I see that we've got lots of Duality and Redundancy. If I was facing the list, I'd pick out two units to shoot first (the Terminators). Beyond that, I'd not know what to shoot as everything is the same and in numbers. This army would destroy my Mechanized All-Comers list found on my army list page, and that is a good list that I've won numerous times with. I think every army would find it difficult to silence all of the guns available to this army before being wiped out. This army is probably as close as we'll get to tabling an opponent consistently. Very scary list to see on the other side of the board. You'll want to check out Part Three: Assembling Your Crusade next!